Happy Hour — it might just be the best time of the day. Where’s your favorite place to go? Now, where’s your favorite place to go in Boca? 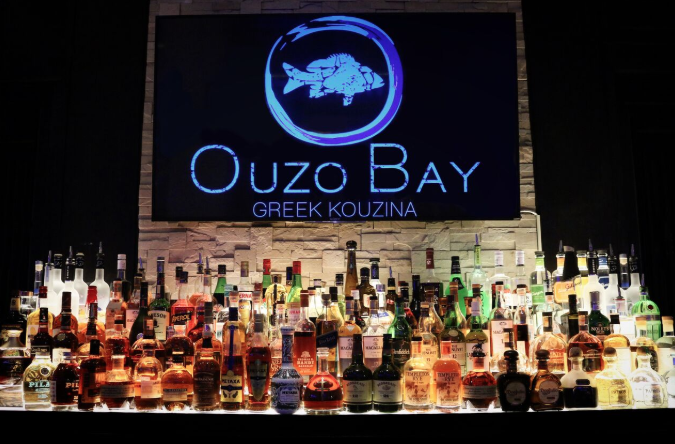 Here’s one for you — Ouzo Bay in Mizner Park. This Mediterranean-themed restaurant offers happy hour pricing in their lively bar area – not for one hour, not for two hours, but for the entire night, starting at 4 p.m. This is something that we could get accustomed to. Pair those drinks up with a classic mezze sampler, a chopped lobster salad, or bronzino — or with their early-bird 3-course dinner menu (available from 4-7 p.m.), where you order an entree and get an appetizer and dessert on the house. Other specials that you’re going to love include dining at Ouzo Bay between 4-7 p.m., when you get a free bottle of wine with the purchase of 2 entrees; lobster night, when you can order a 1.5 lb lobster served with lemon potatoes, asparagus, frisée salad & beurre blanc for $29.99; and as an added bonus, Ouzo Bay will offer live music on Thursday, Friday and Saturday nights. If you liked this post, you might like our Guide to Happy Hours in CityPlace.